This volume's got some interesting stuff in it, but it's not really the peak of Ezquerra's work on Dredd. It's mostly devoted to two projects he worked on, neither of which is quite enough to justify a volume of its own of the length Rebellion tends to publish: "Helter Skelter" and the Cursed Earth Koburn material, and otherwise mops up his otherwise uncollected Dredd episodes from the Megazine. 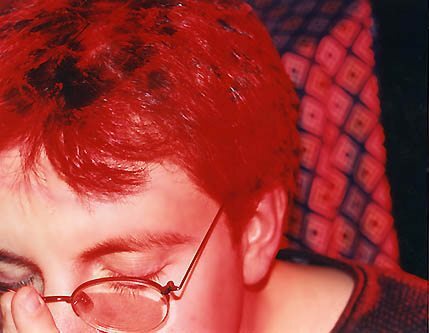 After John Smith and Jim Baikie (et al. )'s "New Statesmen" serial ended, one of the series that started in Crisis #15 was "Troubled Souls," by Garth Ennis and John McCrea. Ennis has no particular love for that series, I gather--he was 19 years old when it started--but it's where he introduced a couple of supporting characters named Dougie and Ivor. Ennis and McCrea brought them back in "For a Few Troubles More," a bit later, and then in Dicks, a project they've been doing on and off since 1997. But--whoops--Fleetway still owned the rights to "Troubled Souls," and hence to Dougie and Ivor, from what I gather. 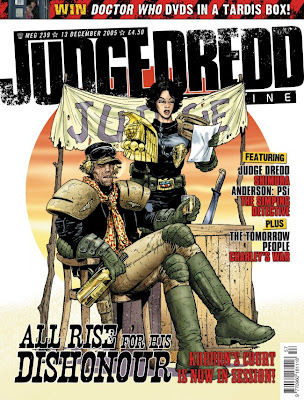 It's not Ennis's final Dredd story (that would be "Monkey on My Back," a couple of years later--and Ennis was also mentioned as working on the prematurely announced American Dredd series from Dynamite in 2008). 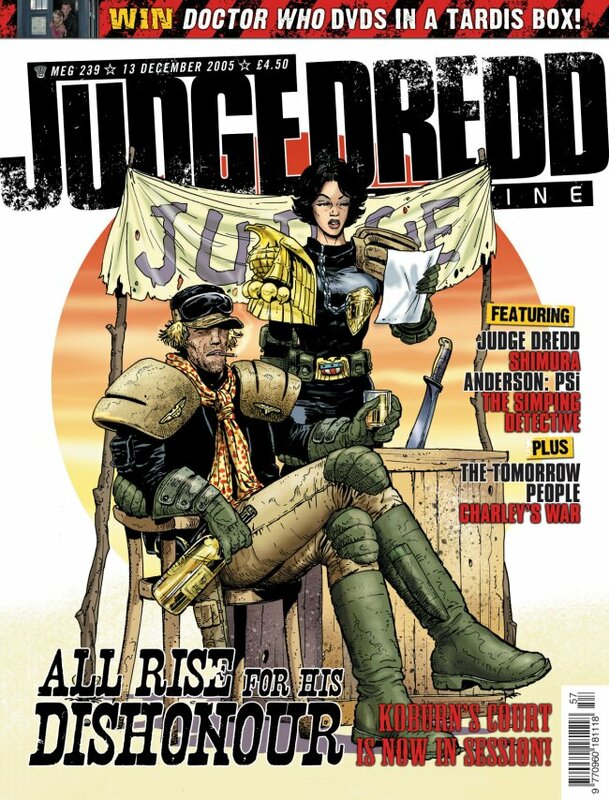 It is, however, his undisguised love letter to the 2000 AD of his youth: a chance to bring back all the Dredd characters he loved, and throw in cameos and quotes from Rogue Trooper and Halo Jones and Ace Trucking Co. and The V.C. 's and so on, on the pretext that they're all in nearby alternate universes, of which there are "at least two thousand," ha ha. 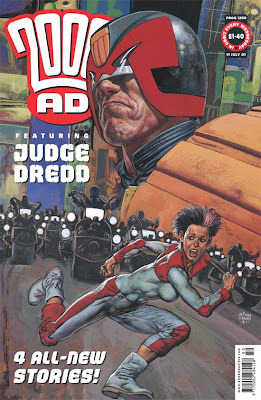 And it lets him write Dredd the Total Badass to End All Badasses one more time, when he doesn't stoop to killing Rico with his gun but kills him by throwing his badge at him so hard it embeds itself in his skull, then makes a misguided young democracy-loving engineer see the error of her ways. The crucial difference is "Helter Skelter"'s implication that the lost paradise for readers is the past. Ennis mentioned in his interview with David Bishop that he thought the last genuinely great issue of 2000 AD was "the last one printed on bogroll"--that the spell was broken after it went full color. That's an excuse to not try to push it forward. The back half of The Carlos Ezquerra Collection is all the Gordon Rennie/Ezquerra Cursed Earth Koburn stories published up to that point (there was another one serialized in the Megazine last year. The point of Koburn would have been entirely lost on me without an explanation: between 1976 and 1978, Ezquerra drew "Major Eazy," a well-loved series in Battle Picture Weekly, whose protagonist was a laid-back British officer with no interest in anyone's rules but his own, and modeled on James Coburn's character from The Magnificent Seven. This Alan Barnes interview suggests that Ezquerra mentioned to Rennie that "he'd love to do a desert rat story," and Rennie came up with the idea of transplanting a thinly disguised Major Eazy to the Cursed Earth. Ezquerra clearly enjoys drawing this stuff, even though the stories here don't give him a lot of leeway to come up with particularly impressive visuals. The design of Eazy/Koburn presents a couple of the same challenges to an artist that the design of Dredd does: we can't see their eyes, and they have one facial expression almost all the time. Dredd, though, has a certain amount of body language to communicate with, and Koburn mostly just slumps. There's some solid writing here--I especially like the scene where Koburn's getting shrapnel picked out of his body and gets through it with booze rather than painkillers--but the Cursed Earth setting (guess what: it's full of hicks!) is much flatter than Mega-City One. As for the other, shorter stories here (besides "The Taking of Sector 123," which Jog and I dealt with a while back, and which is probably my favorite piece of Ezquerra's work in this volume), there's not a lot to say. "The Girlfriend" is effectively the same idea as Inga from the P.J. Maybe stories, and probably more effective as a background joke than as the focus of a plot. 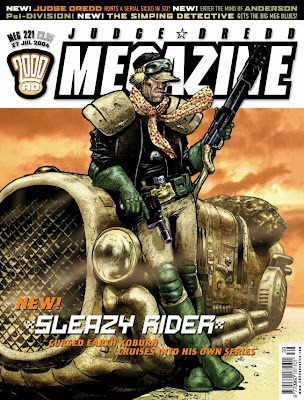 And for the launch of what was effectively the fifth volume of the Megazine--the renumbering and reformatting that began with #201 in 2003--Wagner and Ezquerra couldn't do any better than "Phartz!," a 20-page fart joke? 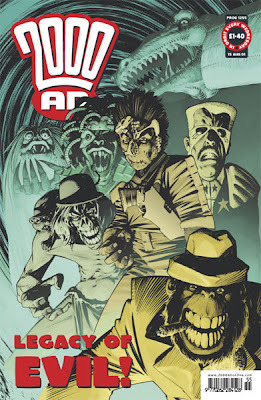 Next week: Satan's Island, in which Orlok's fate is revealed.